The greater the disparity in wealth between the very rich and everyone else, the more unstable an economy becomes. Our nation has now created a larger gap in the distribution of wealth than the massive chasm that helped fuel the Great Depression. In 1928, one year before the global economic collapse, the wealthiest .001% of the U.S. population owned 892 times more than 90% of the nation’s citizens. Today, the top .001% of the U.S. population owns 976 times more than the entire bottom 90%. This is not sustainable, and makes for a very volatile economy. It would appear that the American empire is about to crash. 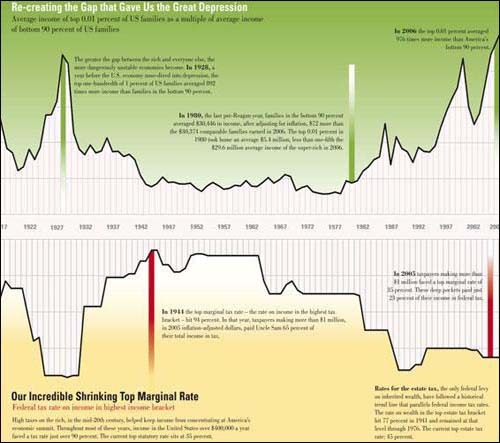 See the full-size wealth inequality chart at the Nation. This dire economic situation just didn’t happen by accident either. The wealthiest 1% reaped 2/3 of the economic benefits from Bush’s tax cuts. Cheney’s war-profiteering stock options continue to skyrocket, while many of us are now unemployed, just struggling to eat and pay rent. States across the country are reporting staggering increases in food stamp usage. According to the U.S. Department of Agriculture, last year the national increase was 18%; California’s food stamp usage has risen 30% since 2007. 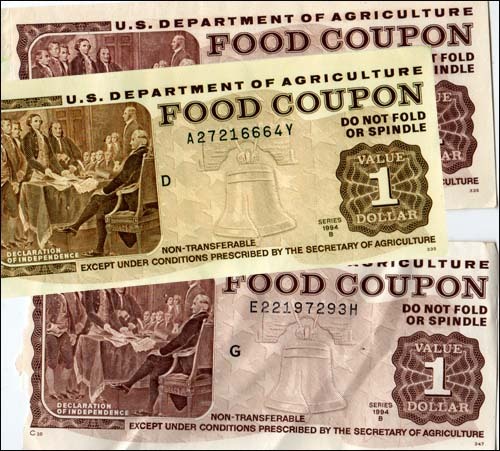 Half of all kids will be dependent upon food stamps at some point during their childhood. 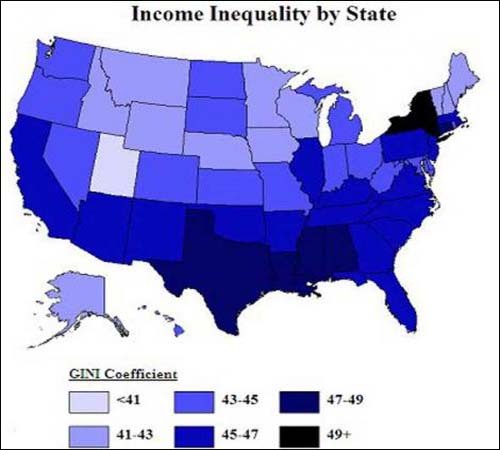 UC Berkeley Professor of Economics, Emanuel Saez, has been researching the growing disparity in income inequality in the United States for years. His work was published in the Quarterly Journal of Economics; it provides in-depth analysis and useful insight into just how extremely economically polarized and desperate our country has become. 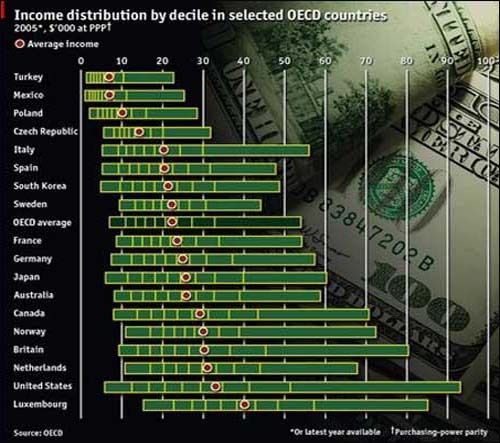 The size of America’s income disparity is nearly twice that of the average of other nations. Some would say we are on the brink of a new kind of revolution. One where most people run their own businesses, and that slowly takes power away from the top and puts it back in the hands of the public. Just read End of Jobs or 4 hour work week to see how you can set up your own business and get out of poverty. Just look at how kickstarter and the likes are empowering anyone with an idea to compete with global players. Go forth and be free!